Z Pan, W Hunter. Hydatid Cyst Of The Liver: A Case Report And Review Of The Literature. The Internet Journal of Parasitic Diseases. 2006 Volume 2 Number 1. Hydatid cyst of the liver is caused by a tapeworm, Echinococcus granulosus. Echinococcosis is a very rare disease in the United States, with an incidence of less than one case per one million inhabitants, although the occurrence has been rising. This has led to the necessity for physicians to be more aware of its clinical features, diagnosis, and management. We here report a case of hydatid cyst of the liver with a brief review of the literature. 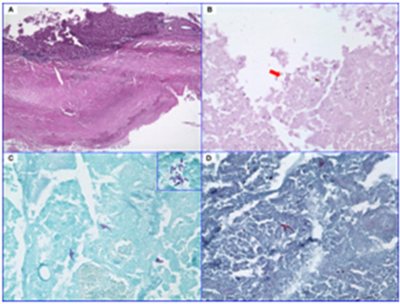 In this report we indicate that Ziehl-Neelsen stain and trichrome stain are very helpful in diagnosing old hydatid cyst when the tapeworm is not easily identified by Haematoxylin and Eosin stain. A 37 year-old Middle-Eastern (Iran) gentleman complained of sharp, right side pain that radiated into his chest. The patient had no history of cardiac disease, and the pain was not associated with cough, wheezing, shortness of breath or hemotysis. CT scan showed two cystic lesions in the liver, one measuring 4.8 cm in the superior right lobe and the other 4.0 cm in the junction of the right and the left lobes. These two cysts were resected completely. Grossly the cyst wall measures 0.3 cm thick and contains gelatinous yellow soft material without any specific organisms. Microscopically, the cyst wall shows dense fibrous tissue with focal dystrophic calcification (Figure 1A). Sections of the cyst contents reveal granular amorphous material with focal calcification. A hooklet-like structure is identified in the cyst contents in Haematoxylin and Eosin (H.E) slides (Figure 1B) after carefully examining throughout the specimen. The hooklet-shaped structure does not polarize, and it is best seen with the condenser down and with refracted light. Specific stains using Ziehl-Neelsen stain and trichrome stain highlight many similar hooklet-like structures that are stained as purple-blue and pink-red respectively (Figure 1C and 1D). Trichrome highlights the hook-shaped structures (40x). Human echinococcosis is a zoonotic infection caused by the tapeworm of the genus Echinococcus. Three of the four Echinococcus species are of medical importance in the human beings, including Echinococcus granulosus that causes cystic echinococcosis, Echinococcus multilocularis that causes alveolar echinococcosis, and Echinococcus vogeli. Echinococcus granulosus is the most common of the three. Echinococcus multilocularis is rare but is the most virulent, and Echinococcus vogeli is the rarest. The life cycle of Echinococcus involves two hosts, one definitive and the other intermediate. Humans act as an accidental intermediate host. The life cycle of Echinococcus has three developmental stages: (1) the adult tapeworms in the definitive host, (2) eggs in the environment, and (3) the metacestodes in the intermediate host. After ingested by the definitive host, the metacestodes mature into the tapeworm in the definitive host and then release eggs into the environment. The egg ingested by the intermediate host hatches in the intestine, penetrates the gut wall, and travels through the lymphatic or blood vessels to the liver, lungs, and other organs. The metacestodes hatched in the intermediate host may grow and occupy the residential organs, where a variety of symptoms can be produced. The dog usually acts as the definitive host for this species, and many mammals act as intermediate hosts, particularly sheep and horses. The incidence cystic echinococcosis in endemic areas ranges from 1-220 cases per 100,000 inhabitants, while the incidence of alveolar echinococcosis ranges from 0.03-1.2 cases per 100,000 inhabitants, making it a much more rare form of echinococcosis. Infestation with Echinococcus vogeli is the rare form of echinococcosis and is reported mainly in the southern parts of South America . In USA, the indigenous cases have been reported in Minnesota and among Native Americans in western Alaska. USA has an incidence of less than one case per one million inhabitants in the continental United States. Northern Alaska has endemic areas of Echinococcus granulosus, and the incidence is less than 10 per one million. Hydatid cyst disease is due to Echinococcus granulosus. It is endemic in cattle-and sheep-raising regions of the world, including the Middle East, the Mediterranean countries, Central Europe, South America, Australia, New Zealand, and South Africa [1, 2, 3]. In the human beings, hydatid cyst disease most commonly occurs in the liver (55-70%) followed by the lung (18-35%), and these two organs can be affected simultaneously in about 5-13% of cases [4, 5]. The clinical presentation of hydatid disease depends on the size and site of the cyst. Most patients with hydatid cysts remain asymptomatic, even into advanced age. Some cysts may produce dysfunction of involved organs, including biliary obstruction, cirrhosis, bronchial obstruction, renal outflow obstruction, increased intracranial pressure, and hydrocephalus. The hydatid cyst of the liver can induce obstructive jaundice and abdominal pain. Involvement of the lungs produces chronic cough, dyspnea, pleuritic chest pain, and hemoptysis. Cyst in the brain may cause headache, dizziness, and specific neurological deficits depending on the location of the cyst in the brain. Free rupture of the echinococcal cyst may cause anaphylaxis, and rupture may also release smaller cysts that can circulate to other organs. Pre-operative diagnosis of hydatid cysts can be made ultrasonically and confirmed by a CT scan. The CT scan has an accuracy of 98% to demonstrate the daughter cysts, and it is the best test to differentiate hydatid cysts from amebic and pyogenic cysts in the liver . A thin rim of calcification delineating a cyst is suggestive of an echinococcal cyst. MRI offers no real advantage over CT scan. Several serological tests can be used for diagnosis, screening, and post-operative follow-up for recurrence. These include the hydatid immunoelectrophoresis, enzyme-linked immunosorbent assay (ELISA), latex agglutination and indirect haemagglutination (IHA) test . The morphological diagnosis by the pathologist is frequently made by the presence of hydatid elements, especially hooklets. In our case, the hooklets are very difficult to find under transmitted light in H.E slides even by carefully examining through the specimen. However, using either Ziehl-Neelsen stain or trichrome stain, the hooklets are stained purple-blue and pink-red respectively, and many hooklets are easily to identify over the background. Therefore, these two stains offer significant advantage in morphological diagnosis of hydatid cysts, especially very old lesions, where hydatid components may be very difficult to identify. The treatment of hydatid cyst is principally surgical resection [8,9,10,11,12]. However, pre- and post-operative one-month courses of Albendazole and two weeks of Praziquantel should be considered in order to sterilize the cyst, decrease the chance of anaphylaxis, decrease the tension in the cyst wall, and reduce the recurrence rate post-operatively. To decrease the risk of releasing circulating smaller cysts, hypertonic saline and ethanol are injected into the large cyst 30 minutes prior to surgical removal. In endemic areas, prevention is primarily through prophylactic treatment of dogs with praziquantel to remove the adult tapeworms. Prolonged freezing of meat or fully cooking can kill cysts in tissue. 2. Hunter GW, Strickland GT. Hunter's Tropical medicine and emerging infectious diseases. 8th ed. Philadelphia: Saunders, 2000:866-76. 3. Goel MC, Agarwal MR, Misra A. Percutaneous drainage of renal hydatid cyst: early results and follow-up. Br J Urol 1995; 75: 724-8. 4. Altinors N, Senveli E, Donmez T, Bavbek M, Kars Z, Sanli M. Management of problematic intracranial hydatid cysts. Infection 1995; 23: 283-7. 5. Brown RA, Millar AIW, Steiner Z, Krige JEJ, Burkimsher D, Cywes S. Hydarid cyst of the pancreas: a case report in a child. Eur J Pediatr Surg 1995; 5:121-4. 6. Kir A, Baran E. Simultaneous operation for hydatid cyst of right lung and liver. Thorac Cardiovasc Surgeon 1995; 43: 62-4. 7. Guntz M, Coppo B, Lorimier G, Cronier P. Hydatid cyst of the liver appearing late (10-22 years) after surgical treatment of pulmonary hydatidosis. Physiopathologic problems J Chir Paris 1990; 127: 375-81. 10. Safioeas, M., Misiakos, E.P., Dosios, T., Manti, C., Lambrou, P., & Skalkeas, G. (1999). Surgical treatment for lung hydatid disease. World Journal of Surgery, 23, 1181-1185. 11. Daradkeh S, El-Muhtaseb H, Farah G, Sroujieh AS, Abu-Khalaf M. Predictors of morbidity and mortality in the surgical management of hydatid cyst of the liver. Langenbecks Arch Surg. 2006 Sep 20. 12. Menezes da Silva A. Hydatid cyst of the liver-criteria for the selection of appropriate treatment. Acta Trop. 2003 Feb;85(2):237-42. 13. Kayaalp C, Sengul N, Akoglu M. Importance of cyst content in hydatid liver surgery. Arch Surg. 2002 Feb;137(2):159-63. 14. Maiocchi L, Brunetti E, Filice C. Hydatid liver cyst treatment. J Ultrasound Med. 2001 Dec;20(12):1377-9.